There are many perks to the summer season—rosé all day, sun-kissed skin, long days, warm nights and of course, summer vacation—but when it comes to our dining routine, we are all about BBQ grills. Whether you are hosting a BBQ, cooking up a meal for your family or you simply want to kick your cooking up a notch, the grill is about to be your best friend. 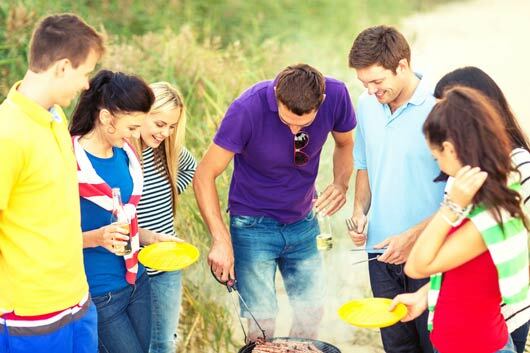 First of all, grilling foods allows you to prepare healthy dishes without skimping on flavor. According to Jillian Michaels, “Compared to frying food, grilling is a much healthier option because you can grill foods without adding oil or fat to them.” In addition to the fact that you don’t need any oil or butter to grill foods, grilling foods “also lets much of the food’s existing fat melt and drip away.” Let’s be honest, we’re all focused on our health when bikini season strikes, and grilling ideas are an excellent way for you to enjoy your food without ditching your diet. But how many ways can you grill a piece of meat? And how many days a week can you eat grilled veggies before you want to inhale a massive bowl of pasta? While we can’t help with the pasta craving, we can help on the grill front. The list of grill-friendly foods is way longer and more interesting than you might have guessed. Tis the season to fire up the grill and cook everything from meat to veggies to fruit and beyond.